Tracking – this allows you to monitor your moods and events at any point in the day. Reports – made from your tracking information these help identify patterns and triggers in your day that help you understand why you feel the way you do. Modules – these contain skill building activities to help you develop new coping skills. Diary – this is a space you can record whatever information you like at any time. You might want to record your thoughts and help get a few things out of your head so they stop getting in the way. Stories – these are stories of people who have been in similar experiences to you. Learn – this section has more information and tips on mental health which you might find useful. What’s good about it: You can access the service on your computer of phone and you don’t have commit to a certain day or time to complete the modules and get help. What’s not so good: You will need an account to use this but I’m not sure if you need to log into it every time you use it so the diary function may not be as secure as it could be – happy to be wrong though! Regardless the rest is great so give it a go. I think every year around March I feel like time is going slow, things are slower paced and there are less looming deadlines. I’m not sure if this is because semester is just starting and students and staff are enjoying the feel of things just starting or if its a reflection of less holiday, birthday and social commitments I have in my life at that time? Either way this time of the year always feels faster to me, and I find it harder and harder to find the time in my life for all my commitments let alone time just for me to relax and unwind. But I must find, or make the time to spend the time on me or I don’t think I’ll have enough motivation and energy to get through the rest of my commitments for the year! So I’m having a look at what time I actually have left. I suspect it’s going to say none, but you just never know. Lets start with how much sleep I’m getting each night, I’d say on average about 6 hours at the moment. What about personal grooming? mmm I’d say another hour a day goes into that. Another 3 hours a day making, eating and cleaning up after meals, about 1 hour a day of travel time, and 2 hours in after school activities for the kids. Chores and errands would take another 1-2 hours per day, so lets split the difference and say 1.5 hours a day and add another 7 hours per day for work…how many is that? 21.5 hrs…..what am I doing with the other 2.5 hrs? Truth be told I’m probably either working or doing chores, but what I can now see is that I could probably let a few chores go or work a little less from home and start using this time to look after me? Go out to dinner with a friend? Get back to walking or the gym, read a book and watch a movie. Maybe then I’d feel a little less exhausted each day? There is definitely truth in the fact that we get more done when we are working more effectively rather than just a greater quantity of hours. Students get better grades when they have a balanced lifestyle, rather than one where there are too few or too many hours spent studying. We feel better when we get a more even balance of work/study, exercise, social activities and relaxing time. So if you are wondering where the time has gone, feeling a little overwhelmed at the moment or wanting to escape it all maybe it’s time to take stock of what hours you spend on what activities like I have and look to prioritise yourself and get a more balanced lifestyle. Even if all you have left is 30 minutes, maybe that’s 10 minutes to sit and have a cup of tea, 10 minutes to go for a walk across campus, and 10 minutes to give a friend a call? The changes don’t have to be big, little ones are a great way to start! Do you find it difficult to get to sleep at night? Are you feeling edgy and easily agitated? Do you find yourself saying “I need a coffee”? If you answered yes to any of these it could be time to review how much caffeine you are consuming and what impact that is having on your sleep and general wellbeing. Caffeine is a smartphone app that you can use to firstly get some more information of what food and drinks contain caffeine, what the guidelines are for safe consumption of caffeine and tips for how to reduce your caffeine intake. You can track what you are having as you are consuming it on the front page by taping the + button and watching your flask fill with bubbles. This will update your status, potential impact on how you will feel later and how many hours it will be before you can engage in quality sleep. You can also look at your history over time and see how you are going on reducing your consumption. What’s good about it? : It’s really easy to use and gives you a quick idea of how caffeine consumption is impacting on your mood and your sleep. What’s not so good about it? : It’s an American app so the programmed drinks and food are mainly American. You can add your own customised drinks for easy selection but you have to know the caffeine content of each of these to enter them into the list. As a child we often fight sleep. As an adolescent we often change our patterns depending on our social, study and work commitments and parental pressures. In early adulthood we make the rules and when we find ourselves parenting we ache for more sleep and wonder why children fight it so hard. As students we try an find all the tricks to staying awake, either to finish an assignment, prepare for an exam or to keep up with the social activities. One way we try and achieve this is with stimulants, often caffeine related. over 50% of Australian’s caffeine intake comes from coffee, with cola (18%), tea (16%) and energy drinks (5%) making up a majority of the caffeine stimulants. Whilst it has short term benefits of speeding up the brain and central nervous system, increasing concentration and alertness it’s long term effects of increased risk of blood pressure, heart disease, insomnia, ulcers and infertility make this a risky choice. Not to mention the addictive nature of caffeine and the side effects of withdrawal, headaches, cravings, mood swings and agitation. Limit yourself to less than 400mg of caffeine daily – this is around 5 cups of instant coffee or 5, 250ml of energy drinks. Avoid single doses of caffeine that are in excess of 200mg as these can alter your blood pressure, hydration and body temperature within 30 minutes of consumption. If your worried about your levels of consumption and want to reduce your intake reduce slowly over a period of time to avoid the side effects of withdrawal. Find substitutes like eating an apple, taking a walk, drinking water or going for a swim to increase your alertness and brain activity. 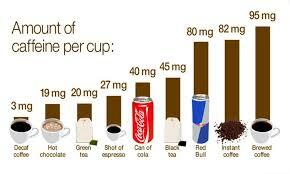 Caffeine may help you finish that assignment on time but over time you will work less efficiently. You can make the best use of your time by getting quality sleep and working more effectively in the time you have as a result of that sleep. Tomorrow join us to raise awareness of the mental health and and well-being needs of those who study and work in universities. We have planned a full day of fun activities, music, food and useful information across all our campuses to celebrate the second Australia and New Zealand University Mental Health and Well-being Day. For more information check out the event page. Struggling with anxiety? MindShift is an app designed to help teens and young adults cope with anxiety. It can help you change how you think about anxiety. Rather than trying to avoid anxiety, you can make an important shift and face it. There is information about different types of anxiety, the triggers, symptoms and treatment available for anxiety. You can record your own personalised situations and track your progress using the different tools. Speaking of tools there are a range of relaxation, thinking and practical strategies to help you reduce your anxiety as well as a place to record your plan of what steps to take. This app is a great tool to use when you are already seeing a counsellor or if you are trying to tackle the problem yourself. There are also a series of inspiration quotes to help change your thinking style and a password protection option in the settings to ensure that your information stays private. What’s good about it: There is a quick tips section if you don’t want to go through the more in depth program so it caters for people at all levels of motivation in getting a start on managing their anxiety. What’s not so good: It’s important that you go through the thinking right and chill out tools before you do the “my situations” because it will ask you for your favourite certain tasks and you need to know what they are first. When people talk about experiencing anxiety they talk about a range of different symptoms and triggers. The most common is generalised anxiety disorder where symptoms of anxiety are triggered a cross a number of different scenarios. Another common type of anxiety is social anxiety triggered by a fear of social situations like performing in front of someone or social interaction. For those people who experience social anxiety there is a fear of being humiliated, embarrassed or criticised even in the most ordinary everyday experiences like eating a meal in front of someone. Social anxiety affects around 10% of Australians and is more common in women. It’s more than just feeling nervous or having a shake about having to give a presentation in front of the class. It can include things like excessive perspiration, nausea, diarrhoea, trembling, blushing and stammering. Why people develop social anxiety is still up for debate. There is evidence that temperament can contribute with those who are shy or have less social interaction when teens are more likely to develop it. Or as children those who were more clingy, easily cried or were shy. There is also research which suggests that environmental situations such as being bullied at school could develop this learned response or that genetics plays a role, with it being more common in those with a family history. Regardless of why you find yourself in this position there is help available. You can check out the Mindspot Clinic’s Wellness Course which helps build anxiety management skills as well as general good mental health strategies. Or check out the BC Anxiety resources you can try yourself, or make an appointment to talk to someone from counselling , either online or face-to-face about getting some help. If you would like to talk with a counsellor don’t forget our Skype drop-in hours or contact me to make an appointment time either on Skype or BlackBoard Instant Messenger. Or if you prefer to see someone in person then please feel free to contact us on 49215801. I’m sure most of you have heard about Headspace, a free counselling service for young people aged 12-25 years of age. I’m wondering if you knew you could also access this service through the phone line 1800650890 and through a web chat platform as well? eheadspace has a web chat platform is available again for 12-25 year olds or for the parents or carers of someone in this age range when there is a concern about their mental health. They cover a broad range of areas from bullying, drug and alcohol issues, depression, anxiety, relationships or being concerned about a friend or family member. You need to create an account using your name and e-mail address, although your full name isn’t a requirement as long as they can confirm your e-mail address with you as a source of contact. The web chat is available from 9am to 1 am the following day and while you can make an appointment to secure your time, no appointment is necessary. If you haven’t made an appointment and all the counsellors are already chatting with someone you may need to wait a little while or be asked to come back in a short while. What’s good about it: No appointment is necessary and it’s open 17 hours of the day. What’s not so good about it: mmmmmmm, maybe that you have to wait a little if it’s really busy. But really when was the last time you could get to see anyone without an appointment. It will be worth the wait. One of the things I’ve learned over the years of working in mental health is that any strange behaviour someone has is usually mislabelled as mental illness. The other common myth is that anyone with a mental illness is dangerous towards others. It’s important that we break these two myths as they stigmatise people who experience poor mental health and make it harder for them to ask for and get the help they need. To break these we need to understand different types of behaviours and symptoms and know how to get the help that’s needed. Confused or impaired thinking which is observed as switching topics of conversation rapidly or making reference to out of context topics. False thoughts or delusions – these can be of paranoid ideas like someone is following you, grandiose or exaggerated sense of importance or a somatic thought that you have a terminal illness when you don’t. Of course these are the later stages when it becomes more noticeable. Earlier signs are a little more general and can include difficulties concentrating, a change in mood (low), increased agitation, anxiety, changes in your sleep patterns, being suspicious, withdrawing from people or experiencing unusual thoughts. About 3% of the population experience psychosis. Onset is usually in late teens or early 20’s. For some people it will be triggered by a physical illness, for example dementia, stroke or epilepsy. For others there could be a genetic component or an environmental condition. Environmental triggers include illegal drug use, prolonged lack of sleep, or stressful events. Some people will experience prolonged symptoms and others will be shorter in duration. Some may experience psychosis a few times throughout their life while others more frequent. Regardless of the presentation there are treatment options available. If you are on campus and concerned about someone who is showing some of these signs then you can make contact with a Health and Welfare Advisor or Student Support Advisor who will help you get your friend some help. You can find us in the Hunter Building across from the stairs to the Griffith Duncan Theatre if you want to walk over and drop in. If you are not sure if what you are noticing is something to worry about then why not use the Skype Drop-In times to talk with me about it and get some advice about what to do next. If you are off campus and worried about someone or yourself then give the NSW Mental Health Line a call and chat with them about what to do or see a GP or take your friend or family member to the local hospital for help. Don’t forget if it’s an emergency and you are worried about someone’s safety then call 000. Remember that mental illness and in this case Psychosis doesn’t discriminate, it can happen to anyone regardless of age, weight, height, gender, sexual identity, religion or culture. It could happen to you, or someone you care about. Don’t be afraid to seek help or ask someone if you can help them get some help.